Why pay TOO much for Insurance? As an independent agency we help protect your assets while saving you money. We are dedicated to building long-term relationships by providing clients with timely service, proper coverage, competitive and affordable products and assistance through the claims process. Bill Teegen Insurance offers coverage for home, auto, life and business. Ask us about Personal Insurance including Automobile, Homeowners, Watercraft, Umbrella, Dwelling Fire, Farm Owners, Life, and Health. Commercial Insurance is available as General Liability, Business owners policies, Business Auto, Workers Compensation, Property, Professional Liability, and Inland Marine. 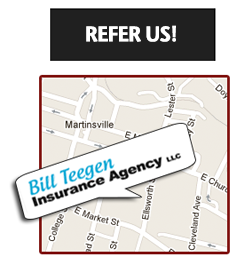 We cover it - call Bill Teegen Insurance Agency Today! We would like to thank all of our customers for your loyal business over the past year!